The terminal branches of the superior and inferior epigastric arteries course deep to the posterior aspect of the left and right rectus pillars and penetrate the posterior rectus sheath. Injury to these vessels or to any of the network of collateralizing vessels within the rectus sheath and muscles can result in a rectus sheath hematoma. Patients frequently describe the sudden onset of unilateral abdominal pain that may be confused with lateralized peritoneal disorders such as appendicitis. Below the arcuate line, a hematoma may cross the midline and cause bilateral lower quadrant pain. History and physical examination alone may be diagnostic. Pain typically increases with contraction of the rectus muscles and a tender mass may be palpated. 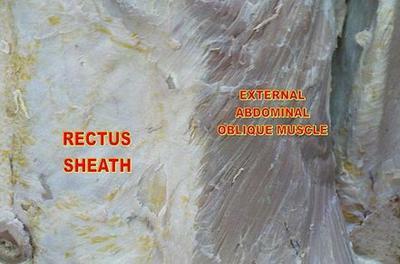 The ability to appreciate an intra-abdominal mass is ordinarily degraded with contraction of the rectus muscles. Fothergill's sign is a palpable abdominal mass that remains unchanged with contraction of the rectus muscles and is classically associated with rectus hematoma. A hemoglobin/hematocrit level and coagulation studies should be obtained. Abdominal ultrasonography may show a solid or cystic mass within the abdominal wall, depending on the chronicity of the bleeding event. Computed tomography is the most definitive study for establishing the correct diagnosis and excluding other intra-abdominal disorders. Magnetic resonance imaging (MRI) also has been employed for this purpose. What kind of doctor can treat/oversee this condition. My husband was diagnosed with this last week and we don't know what kind of doctor to follow up with. I have never ever been in so much pain before in my life. I was driving home from the beach when the pain hit me. I had not had any trauma. Finally pulled off the side of the road and called 911. I was 50+ miles from a hospital and couldn't get anything for pain being I'm allergic to morphine. In the ER they did a cat scan with dye. The doctor said I was very lucky to be alive. The next couple of days were a blurr. Days later I ended up at a rehabilitation facility. The nurses were horrible along with the CNA's. The rehabilitation people were great. I would hate to think I had a loved one there. I'm still in pain but I'm home and don't have anyone to help me. I'll be glad when I can drive and get around on my own. I'm very thankful I'm alive.